Most minerals on Earth are formed when magma rises from the depths of the planet to the surface and then cools. Crystals form from chemical elements present in the liquid rock, somewhat like the way rain turns into snow crystals in the cold. Over time, the structure of some minerals changes under high pressure or high temperatures, producing new kinds of minerals in the process. More than 3,500 different minerals have been discovered so far. Most of them combine to form rocks, like the quartz, feldspar, and mica found in granite. The rarest and most beautiful may be turned into jewelry. This family of minerals, called gems, groups together some 50 different semiprecious stones, including agate, opal, and jade, and four precious stones. These most highly prized gems are diamond, ruby, sapphire, and emerald. The pearl is one of the gems most favored by jewelers. Unlike other gems, however, pearls do not come from rocks, but from animals! These small, hard, shiny beads are manufactured by pearl oysters. A pearl forms when a foreign object, such as a grain of sand, gets into an oyster’s shell. The creature protects itself by secreting a substance called nacre, which coats the irritating bit of sand in several layers. About one in every 100 oysters is hiding a pearl! The minerals in rocks are essential to our lives. They make up many of the objects and materials we use every day. The calcite found in limestone, for example, is used to manufacture cement and asphalt for roads. The minerals in clay are used for making ceramics, bricks, and pottery. There is fluorite in toothpaste, graphite in pencils, talc in cosmetics, and silica in glass, mirrors, and computer chips. Other minerals include the stones used to make jewelry. Geologists are scientists who study the materials that make up the planet. To identify and classify the minerals in rocks, geologists examine a number of features, such as hardness, transparency, form and structure, color, streak color, and sparkle. It is possible to identify a mineral by its hardness. Some minerals like talc are soft and can be scratched with a fingernail. Other minerals are the opposite. A diamond, for example, is so hard that it can only be scratched by another diamond! A mineral can be identified by its transparency. 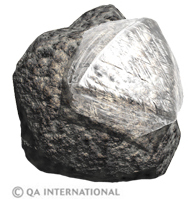 Quartz, for example, is sometimes completely transparent, that is, one can see through it. Copper is opaque. It is impossible to see through. 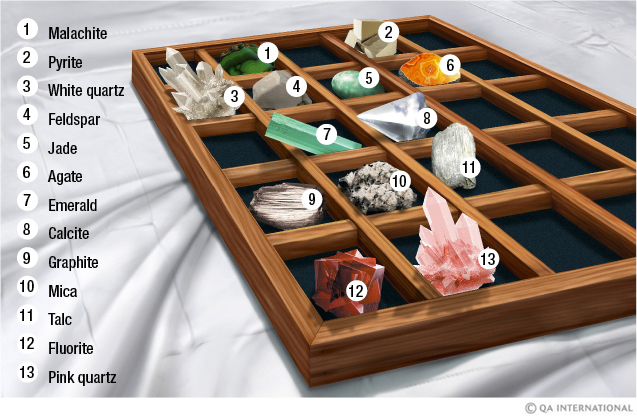 Many minerals can be identified according to their outer appearances or internal structures. Silver crystals have an arborescent form, which means they resemble tree branches. Hematite may look like small balls. Pyrite’s internal structure is the shape of a cube, while the form of the emerald is hexagonal, or six-sided. Some minerals can be easily identified by their color. Malachite, for example, is always green. On the other hand, minerals like quartz come in a wide variety of colors, including white and pink. If the color of a mineral is not always a reliable clue, the color of its streak is. The streak is a powdery line left by a mineral when it is scraped on a porcelain plate. A mineral may come in a wide variety of colors, but the color of its streak almost never changes. Sparkle is the twinkle and reflection of light on a mineral. 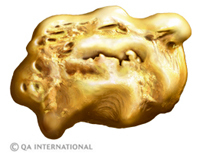 Some minerals like gold have a brilliant metallic sparkle, while others like quartz have a glassy sparkle. Jade has a somewhat greasy sparkle, as if it were covered in oil.